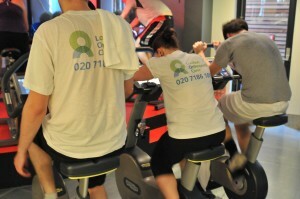 If you want to get ‘super-fit’ this Spring, why not sign up for the second annual Super Sprint Triathlon on Sunday 14th April 2013, hosted by long-standing Trinity client, The London Orthopaedic Clinic? The charity event, in aid of Help for Heroes, see ‘competitors’ put through their paces in three consecutive events; a quarter of a mile (400m) swim, followed by a 10K (6.2 mile) cycle and a 2.5K (1.5 mile) run. If you’re thinking about training for a triathlon, this is a great ‘starter’ event and it all takes place in the exclusive Marylebone gym, The Third Space (www.thethirdspace.com) who kindly donate facilities for the day. Last year’s Super Sprint Triathlon raised nearly £3,000 for Help the Heroes. If you’d like to support the cause, and make a donation please visit www.bmycharity.com/helpforheroesTLOC2013.